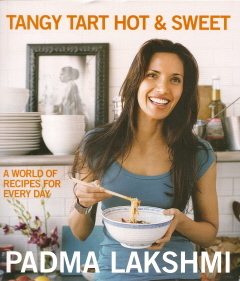 cooking w/love logo "We Are Cooking with Love"
This month's selection is Tangy Tart Hot & Sweet by Padma Lakshmi. I have enjoyed watching Padma as the host of Top Chef, and wondered how someone so thin could eat all that food. Padma is an actress, international model, and notd cookbook author. This is her second cookbook. The book is beautifully photographed, not only with pictures of the recipes, but with pictures of Padma's family. As usual, it reads like both a novel and a cookbook. In addition to the recipes, there are descriptions of food facts as well. FOr example, on the page with the selected recipe for this month, Padma gives a short course in Cardamom, one of the essential ingredients of the recipe. The book is peppered (no pun intended) with recipes, tips, and enchanting stories of Padma's life. This is a great book to add to your collection because it has something for everyone...from Indian cuisine to Italian, to Southern Fried Chicken, Padma didnt miss a beat! This book was a little different that the books that I usually buy, because I tend to choose a book if it has one recipe I want to try. When I flipped through this book in the store, there were several recipes that looked intriguing. This offers both the novice cook and the more advanced cook something to pick from. There are very simple recipes, and those that are a little more complex. There are recipes with ingredients found in your average kitchen panry, and then there are recipes that require more exotic spices, that m you may not have in the average kitchen. There is a little something for everyone. I choose this recipe because as I am sitting here in Upstate, New York on a freezing January evening watching the snow come down, there looked like little balls of snow to me, and I thought, how appropriate! In addition, I love cashews, and although I must confess, I don't use very much cardomom when I cook, the combination sounded very interesting. 1. Combine the butter and confectioners' sugar in a bowl to form a stiff mixture. Add the flour, nuts, vanilla, cardomom powder, and salt, and mix well to form a dough. Let stand for 30 minutes, covered, at room temperature. 2. Preheat the oven to 325 degrees F. Grease a cookie sheet. 3. Make small balls out of the dough about 1 inch in diameter, and place them on the cookie sheet. Smash the balls flat with the bottom of a small glass, lightly dipped in flour to prevent sticking, so resemble irregular clouds. Make sure the cookies don't touch one another. 4. Bake for approximately 22 to 25 minutes (depending on the oven). 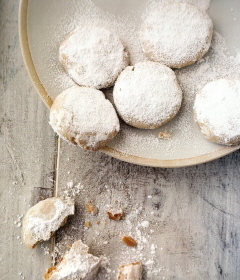 Remove from the oven and dust the tops generously with confectioners' sugar. Cool on racks. Makes about 25-30 cookies, which will keep for a few days in an airtight container.